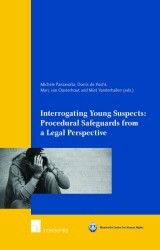 Michele Panzavolta is Associate Professor of Criminal Law at the University of Leuven (Belgium) and part-time Assistant Professor at the University of Maastricht (the Netherlands), where he was a Marie-Curie Fellow for a research on intelligence. He graduated from the University of Bologna (Italy) and obtained his doctorate at the University of Urbino (Italy). He was a postdoctoral fellow at the University of Bologna and a visiting scholar at the University of Cambridge. He is a qualified attorney at the Bar of Bologna and has experience as a practicing criminal lawyer in Italy. He specialises in European and international criminal law and in comparative studies on criminal law and procedure. Besides juvenile criminal justice, his research interests are in intelligence-related topics (surveillance, intelligence analysis, relationship between police and judicial bodies and intelligence services, cybercrime, et cetera), financial crime and asset recovery and, more generally, the protection of individual rights in criminal matters.